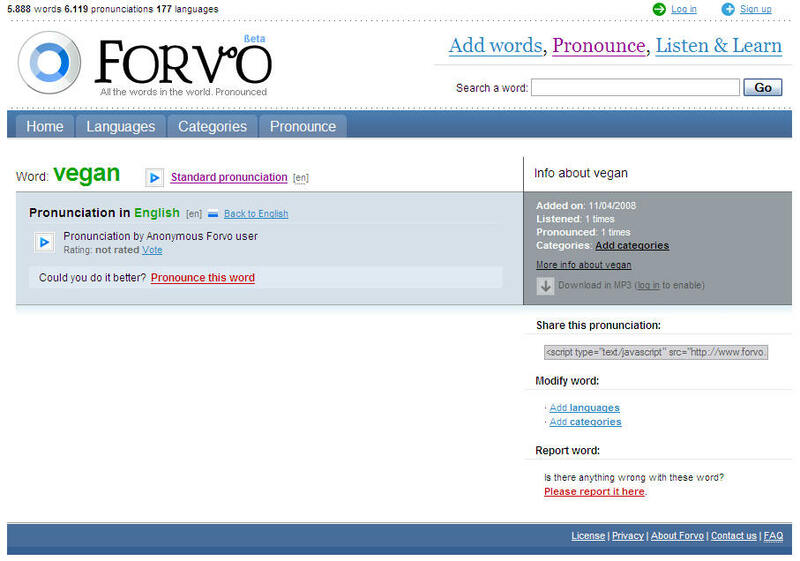 Forvo is a kind of wiki dictionary for the spoken word. 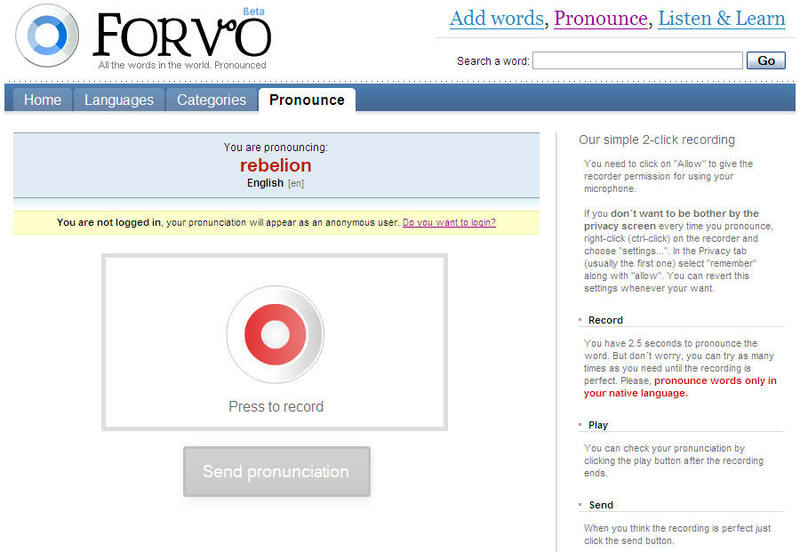 If you’ve ever wondered how a word was pronounced, you’ll love this new service. Just do a search for the word in question in any language and click the speak button to have a native speaker pronounce it for you. It’s a new service so the language and word database is still growing – 5800 words and 6000+ pronunciations in 177 languages – but the beauty of the site is the fact that anyone can contribute, which means it should become super squirrel useful once the user base grows to critical mass. The site is extremely well designed, and the use of categories as well as languages makes it very easy to get at the word you need. Key to the whole thing however is the ease of adding new words, and here the service really does shine. Just click on the Pronounce tab (no need to register), select your language and choose from a list of words that you want to pronounce. The system picks up your microphone driver, and all you have to do is press the big red record button and speak clearly. We’re talking literally seconds to enter a word. I suspect that the developers are inevitably going to encounter some issues with sound quality (e.g. my webcam mic is not the *best* audio source ever) but at least they can get a large amount of info input in a very short time. Once recorded, the words are available for immediate use, and the clever devs have installed a user voting system to ensure that the community keeps the data quality high. There’s also a ‘could you do it better?’ button, which gives others a chance to improve on a dodgy word. Oh and did we mention the fact that you can download mp3 files of the words you’re interested in, and keep track of words that you’ve added? Overall this is a fabulous site, which is excellently designed, clear and easy to use. The fact that it offers such a useful service as well makes it one of those ‘best of the web’ places that you hope will grow to majestic proportions. It’s easy to see a lot of spin-off benefits coming from this service too, once the database grows to a seriously large size. Very cool! What is Forvo? 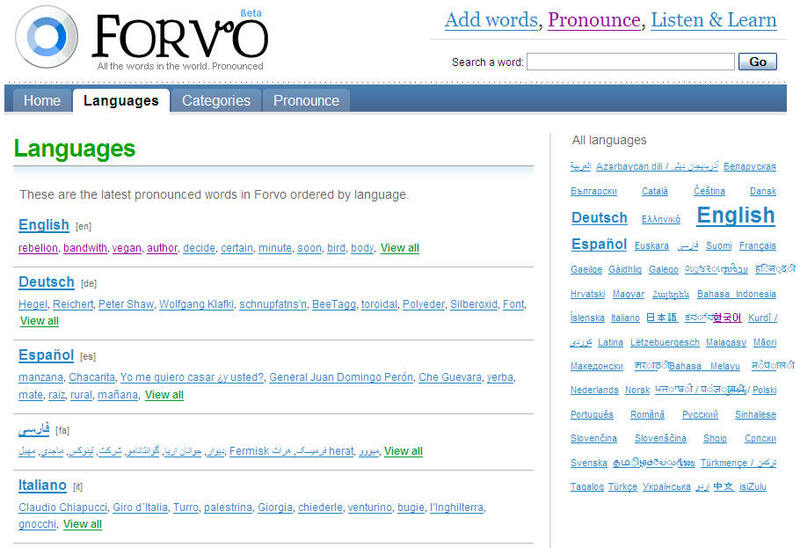 Forvo is an online pronouncing dictionary. We want to have all the words that exist in the world pronounced and recorded, including names. 2. What Forvo is not? Forvo is not for large audio files or documents. It just have audio files of 2.5 seconds. Enough for every word. I use Forvo for my idiom dictionary website, idioMeanings.com. It’s great and is perfect for people learning another language. Plus the guys who work on it are so nice!